First sign of sun and all of London is making the most of it. We are still having water from the sky not the ground! My birthday wasn't a big one, just lots of celebrating with food and family! Wow. This is an ideal photograph for any kind of summer time ad or magazine. Very nice. And puddles to stomp in! I love this. 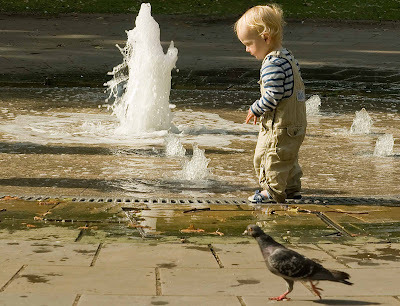 That child is so adorable, and it looks so fun to be playing in the fountain. Great catch.